The two announcements in the Hawaiian newspaper in 1961 only prove a birth was REGISTERED there, not that he was born there. 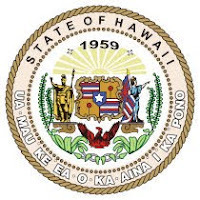 A registration was allowed under Hawaiian law in 1961 to be made by any family member via a simple mail-in form to the state Health Department. No 3rd party or independent witnesses to the birth were required. The statement of a family member registering a new born child as born home was accepted into the registration system with little or no questions back then. Thus the family could lie and register a birth in Hawaii when it occurred elsewhere, anywhere in the world, simply to get the child U.S. citizenship, a highly coveted status then and now. The false registration was not done so he could be President some day. The false registration was done to get the new born child citizenship for that time. It was a case of birth registration fraud to illegally gain U.S. citizenship for a foreign born child of the family. Given Hawaii's very lax birth registration laws in 1961, as I said, Obama could have been born anywhere in the world and if Obama's maternal grandma filled out the form and mailed it in to the birth registration office saying Obama was born at their home in Hawaii, a vital record would be created. And the birth announcement was on the list of births registered that week and which lists were sent routinely each week to the two newspapers. With data systems it is GIGO, garbage (false registration data) in yields garbage out (fraudulently created birth record in the state's vital record system out). And with a falsified birth registration in the system, subsequent computer print outs in later years and carefully crafted statements by Hawaiian officials that they have a record of Obama being born in Hawaii can be obtained and made. But those printouts and statements are being made based on a falsified vital record mail-in registration form back in 1961. WND.com, an online newspaper, did investigations on this first in 2009. They also did follow on stories in 2010 into how the newspaper ads were placed in those two papers in 1961 and the research revealed that the birth announcements were placed by the state, not the family. See these two article links below and many other articles as to how the Honolulu Advertiser and the other sister pub got the birth announcements from a list from the state each week, not from the families. These were public service birth announcements provided by the state. Garbage/falsified data on the available and simple birth registration mail-in form sent into the birth registration office in 1961 by a fraudulent filing by Obama's grandmother to get her foreign born new grandson U.S. citizenship, illegally but easily given Hawaii's lax laws back then, yielded a birth announcement in the paper for a birth in Hawaii that was registered there but did not physically occur in Hawaii. Obama was physically not born in Hawaii, as James Orengo, Member of Parliament, in Kenya recently attested to, as have other MPs in Kenya and as have members of Obama's paternal line family in Kenya. The main stream media is deliberately lying about how these birth announcements got into those newspapers when they tell America that the family placed the ads and that someone was anticipating that someday Obama would run for President. First the family did not place the ads, the state did. And the family member simply filed the false birth registration data on the mail-in form for the obvious purpose of gaining the child U.S. citizenship, a highly coveted status then and now. Birth registration fraud occurs today and it occurred then. And it occurred in 1961 with Obama. The Hawaiian authorities were victims of the birth registration fraud by Obama's grandmother back in 1961 and now instead of admitting it, they are covering up that there is no independent evidence to verify the false registration that Obama was born in Hawaii. No hospital or doctor's name no medical attendants name at the home. Nothing. Just the false testimony of the grandmother on a mail-in form that no one verified back in 1961. With the contradictory statements being made in Kenya by government officials there and members of the family there that Obama was born in Kenya and is not a native born American, the true legal identity needs to be investigated in a court of law. Any reasonable person looking at the evidence for and against Obama being born in Hawaii would say there is reasonable doubt he was born in Hawaii and would demand a further investigation. But the media is covering up for Obama by making false statements to protect him. The media created Obama, covered up for him, and is still a propaganda organ for him. This is a national disgrace. Update: See this Catalog of Evidence prepared in May 2010 by Mario Apuzzo which shows the vast amount of evidence which points to Obama not being physically born in Hawaii and likely just falsely registered as being born there. Does Justice Thomas not want to entertain the eligiblity issue??? We have been told through official channels that charges against LTC Lakin will be handed down shortly--perhaps as early as tomorrow. We have not reached our goal to raise $50,000 to hire civilian counsel to﻿ represent LTC Lakin, and, confidentially, are only about half way there. Terry needs civilian counsel NOW and not just anyonesomeone who is both a proven trial lawyer and a proven conservative who will champion both Terry and our cause to uphold the Constitutions requirement that only natural born citizens hold the highest office in the land. You are missing the point which is what sufficient and credible proof exists that Obam was born in Hawaii. We do not know what evidence Hawaii is relying on to simply say that he was born in Hawaii. If the underlying root "evidence" is fraudulent, then anything Hawaii says is of no value and surely not evidence that Obama was in fact born in Hawaii. In other words, in such a case, Hawaii would be picking fruit from a poisonous tree. We will know what the underlying evidence is only if we can examine Obama's contemporaneous birth certificate from 1961 which is readily available since Obama claims he was born in Kapi'olani Medical Center in 1961. That root document will tell us the name of the hospital in which he was born and the name of the doctor who delivered him. Those pieces of information are highly corroborative of the place and time of birth, for they provide a whole other dimension of contemporaneous facts that would support Hawaii's or anybody else's bare statement as to the place and time of Obama's birth. Your preposterous acceptance of a website that is quite obviously pro-Obama as being somehow factual or meaningful is plainly silly. "It is not a tenet of the Islamic faith that Christians must either be converted or annihilated." If you're dumb enough to believe that they you haven't read much of the Koran or even much about the gbasic tenets of Islam ... they do intend and encourage the slaughter of non-Islamic persons. But this site is not about worthless and politically-movitated websites "proclaiming" misinformation ... it is about the eligibility of the man who has never shown himself to be legally eligible to hold the office he now occupies - so let's stick to the subject instead of trying to confuse things. You said: "A registration was allowed under Hawaiian law in 1961 to be made by any family member via a simple mail-in form to the state Health Department." Yes, but that document could not say "born in Hawaii" on it unless there was proof that the child was born in Hawaii. The officials in Hawaii have said twice that the original document in the files shows that Obama was born in Hawaii. And then we have the numerous statements in Kenya that Obama was born there which you seem to gloss over. For the Obots reading this blog and the "closet Obots" pretending to be interested and trying to help in this lawsuit's merits and visiting here trying to post spin and misleading information in this blog, re-read the rules of this blog. That is not allowed. Also, blatant flaming and telling informed, long-time posters here in this blog to "shut their pie hole" will get your posts moderated and/or deleted too. Spinning for Obama and spreading the typical lies and disinformation and obfuscations found in the Obot blogs is not permitted in this blog. Posting links to the Obot propaganda sites will get moderated out too. Under Article II of the Constitution, the fundamental law of the land, it is up to Obama to prove he is eligible. He managed to hide the truth with an enabling media and the political parties in Washington DC. One can run from the truth but they cannot hide forever. The truth and the Constitution will prevail and Obama, Pelosi, Reid, and McCain will be ancient history. CDR Kerchner : I don't waste my time attempting to correct the foolishly contrived and ever changing fairy tales of the mindless obots, the symptoms they display prove they all have the incurable disorder known as "pica" - they'll swallow anything but the truth. We the People seek full disclosure of the truth and the facts, but as everyone is now aware, the obots are being paid to post scripted lies in an attempt to mislead the public. AS WATER SLOWLY and CONTINUOUSLY WEARS AWAY STONE, SO SHALL THE TRUTH WEAR AWAY the USURPER'S LIES and NOTHING ON EARTH CAN PREVENT IT. CDR Charles Kerchner, my salute to you sir! As I gleaned from being screamed at by a Pelosi rep 4 months ago, they know he's ineligible and don't care that we know, he "won", etc. I've heard on Letterman and other comedy shows they're JOKING about him being ineligible. They do not care! That is the truth of it all. Clarence Thomas interchange with Congressman Serrano (D) shows neither the courts nor the Congress want to be held accountable for this colossal crime. But I believe Thomas injected the topic as a "given"...it removed some of the taboo element of discussing the pink elephant in the living room while providing stark exposure of what I sense is his feeling of haplessness about it all. Clarence Thomas could lead the charge on this one, along with Alito. 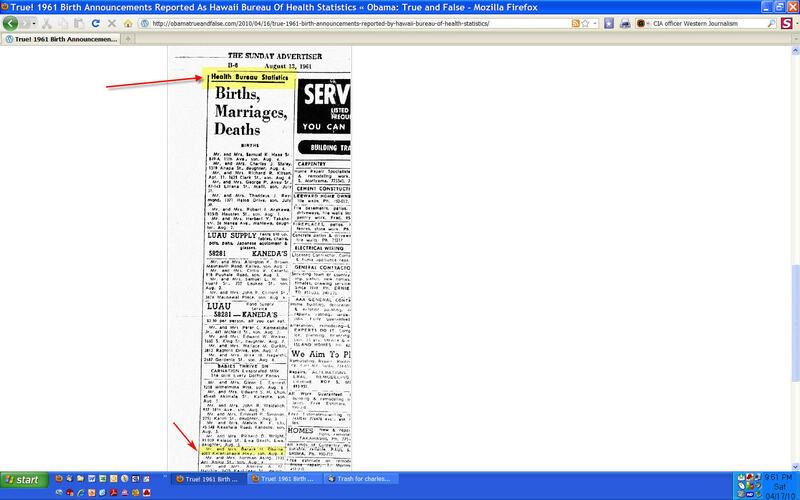 Further proof as to who placed the newspaper birth announcements in the two newspapers in Hawaii in 1961. The name of the section in the paper at the top of the column tells us who, "Health Bureau Statistics". These announcement came from the Hawaii Department of Health each week in a list provided to the papers as public service announcements. What President George Washington was doing with the book Law of Nations in New York in 1789. An account from the times. There was a news account recently that President George Washington 'borrowed' the legal reference book "Law of Nations or Principles of Natural Law" and never returned it to the library in New York and now owes a huge past due fine on that book. This new current events story ties into the importance of that book to George Washington and the other founders. Attached is an image and an the account what the new President was doing with the book in 1789 in New York. The new President was found consulting that book by visitors to his office on his first day in office after the inauguration of him in New York in 1789. New York was then the capital of the USA. 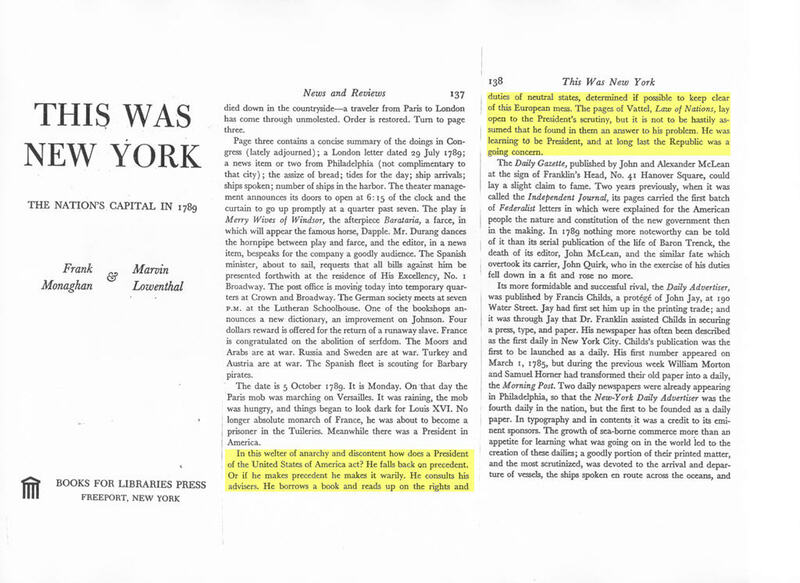 See attached highlighted section of the history book, This Was New York, The Nation's Capital in 1789, by Monaghan & Lowenthal, published by Books for Libraries Press of Freeport NY. I have a copy of this rare book. But it can also be viewed online at Google's book site. The Law of Nations by Vattel is a very important legal treatise and was very important to the founding of our nation. It was first published in 1758. The Law of Nations is mentioned in our Constitution. The "Law of Nations or Principles of Natural Law" which is its full name was the preeminent legal treatise of the last half of the 1700s and was depended on heavily by the Revolutionary Patriots in the founding of our nation. Benjamin Franklin cited that it was being heavily used during the Constitutional Conventions when he received three new copies of the newest circa 1775 edition from the editor Dumas in Europe. And John Jay the 1st Chief Justice of the U.S. Supreme Court cited it often. This legal book was cited many times by the various U.S. Supreme Courts in the 1800s and much of it became the common law of our land via Supreme Court decisions citing the wisdom conveyed in this book. And it is this legal treatise by Vattel which defines who the "naturel" citizens are, i.e., the "natural born Citizens" of a country, i.e., a person born in the country to two citizen parents of that country. This was the law of nature and Vattel codified it in his book Law of Nations or Principles of Natural Law. This book was the source of the wisdom which prompted John Jay to write to George Washington, presiding officer of the Constitutional Convention in the summer of 1787, and request that the requirement of "natural born Citizenship" be put into the new Constitution as an eligibility standard for the office of the President and commander of the military, for future holders of that office after the original generation past, to minimize any chances of foreign influences on that singular most powerful office in our new nation. The founders and framers in their wisdom anticipated the day would come when a citizen of the world funded by foreign money would attempt to take over America. That day has come. Obama is not a natural born Citizen of the USA. He was born a subject of Great Britain. He is not Article II, Section 1, Clause 5 constitutionally eligible to be the President and Commander in Chief of the military for exactly the reasons John Jay stated to George Washington in the summer of 1787. Obama is a Usurper in the Oval Office. Another Kenyan Minister on 14 April 2010 makes a statement about Obama's origins and says that Obama should repatriate himself to Kenya. Pile the above statement on top of another Kenyan minister's statement on 25 March 2010 that Obama "was born in Kenya" and is "not a native American" and the facts are obvious as is explained in this essay by Atty Mario Apuzzo. Obama was born in Kenya and not in Hawaii. Any birth registrations filed for Obama in Hawaii by a family member in Hawaii back in 1961 was filed with false birth location data, probably using the a simple mail-in form then available, for the plain and simple purpose of illegally getting the new born child U.S. citizenship, a coveted and highly desired status then and now. Birth registration fraud occurs now and it occurred then. And in Hawaii in 1961 it was easy to do by just filling in the mail-in form form saying the child was born at home with no witnesses. When is the U.S. main stream media going to cover what is being said in Kenya and stop schilling and covering up for Obama. Obama is not even a native born American, let alone a "natural born Citizen" as is required for the office he usurps. It is time for the 4th Estate of our Constitutional Republic the free press and media and/or the Republican Party to wake up and speak the truth to the fraud of Obama and call for congressional hearings to determine Obama's true legal identity to constitutional standards and then take appropriate action. This disgrace to our nation cannot be allowed to continue.